Mickey Gall has built his UFC career on asking for what he wants and then getting it. With UFC president Dana White in attendance for his professional mixed martial arts debut, Gall took the opportunity to call out former WWE superstar CM Punk, who had signed with the promotion and was training for his first fight inside the Octagon. The call out worked as Gall faced Punk last September and made short work of the professional wrestler turned mixed martial artist. Immediately after that fight was finished, Gall then turned his attention to Sage Northcutt, who had also been discovered by White on his YouTube reality show and three months later he got that fight as well. Now fighters calling out other fighters isn’t exactly new but Gall feels like he proved single handedly that asking for what you want can lead to results and now he’s seeing more UFC competitors following his lead. “Who brought back the f–king call out? Me!” Gall said when appearing on the Fight Society podcast. “Every single week there’s a new call out. Every week there’s a new call out! [Cris] Cyborg’s calling out who she wants to fight on social media, this person’s calling out this person, I get called out every couple months. There’s certainly no doubt that Gall has heard his name being called by more than a few potential opponents since the last time he competed in 2016. 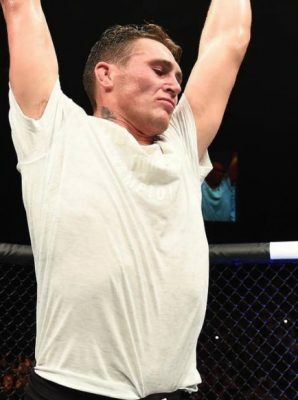 Nothing makes Gall happier than being one of the most called out fighters on the roster because even when he’s not competing, his name stays in the spotlight and that’s exactly where he wants to be at all times. “I love that. They should want to beat me. I’m in a better spot than all these f–king guys,” Gall said. “They all want what I have. They’re going to have to kill me to take it. I’m working really hard. That’s motivation. I love hearing these guys calling me out. I love it. I’m like all right, cool, good, keep saying my name. This Saturday night at UFC 217, Gall will once again get the opportunity to shine when he faces Randy Brown in a welterweight matchup on the preliminary card. Both fighters were discovered as part of White’s “Lookin’ For a Fight” series, but Gall feels like only one of them has truly been elevated to star status both inside and outside the Octagon. Gall promises that will be made abundantly clear when he faces Brown this weekend. “Here’s the biggest difference is I’m a performer. I go out there and I perform. I don’t see that out of him,” Gall said.